So today is gonna be loco.. We are having a zone P-Day!! We're driving up to the cities and going to Valley Fair. So yes, that means.. roller coasters!😜 YES!! I'm super pumped. But unfortunately, it leaves us with limited time to email so I apologize in advance if this is a bit shorter than usual. On Thursday we had exchanges with Mankato, and I had a blast with Elder Atwood. He's ending his mission next week, and is an awesome missionary. It's been a blast working with him these last two transfers, and he has even picked up a few Beatbox sounds from me lol. 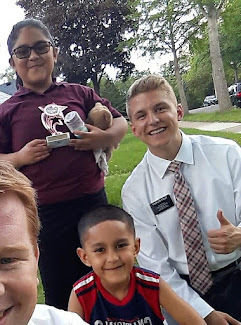 We had some really awesome lessons with a few less-actives of the ward, and also ran into a lady walking on the sidewalk and gave her a Book of Mormon! She said she noticed how much corruption goes on in some churches and how it's confusing to know who is right. She said she doesn't have a religion but studies the scriptures and prays every day. She believes in God with all her heart, but considers most religions to be a form of business. We were able to testify of learning truth by the power of the Holy Ghost. Every morning when we read our scriptures and pray, we are seeking for the Spirit, which helps us feel of God's love and receive our own personal revelation from Him. The Book of Mormon brings the Spirit in my life like no other book can! I treasure every moment I get to read it, and I'm SO thankful for my testimony of Christ that has taken root in me because of this sacred book of scripture. Saturday was super sweet. We planned on going tracting, but we biked through this park right by our apartment to discover a sea of people sitting on lawn chairs. Apparently, there was a free blues festival, and it seemed like the whole town was there! So upon realizing this, we decided to seize the moment and change our plans to do a Chalk n Talk! Basically, we picked a spot on the sidewalk, drew the Plan of Salvation, and talked to people as they walked by. It was actually pretty successful! We got to hand out a few pass along cards, and we also ran into our friend Alex. We taught him a while back at the college with one of the recent converts in our ward, and we got to teach him again! We gave him a pamphlet to read and committed him to pray to know if it's true. So boom, we got a new investigator out of it! And although we were sizzling outside with temps in the 100s plus humidity that day, it was vale la pena for sure! Haha. This week I have been thinking a lot about families. Since we had Stake Conference last week, we had fast and testimony meeting this week. There seemed to be a common theme of families. How incredible is it that our loving God, in his infinite wisdom, would provide for us a way to support, grow, and love one another through FAMILIES! I am eternally grateful for my family, and for my knowledge of eternal families and the amazing plan of happiness that our Heavenly Father has for us. I know that the family is instituted of God, and through the miracle of the gospel of Christ, families can be together forever! Sorry this is so late, but I got a call while at the fair and got some news. First bit of news is I'm staying in St. Peter for another transfer! However, they made it a “zebra area” so I will be with an English companion AND we are moving into the Mankato apartment!! Another missionary frat house lol. So technically we are Mankato 2 Elders. And elder Buhler who was my zone leader in Lakeville is coming to the ward as well. Elder Christiansen goes to St. Paul with my trainer elder Callans! And the other bit of news, I got called to be a district leader! Should be a big transition, but I'm looking forward to it. Love you!